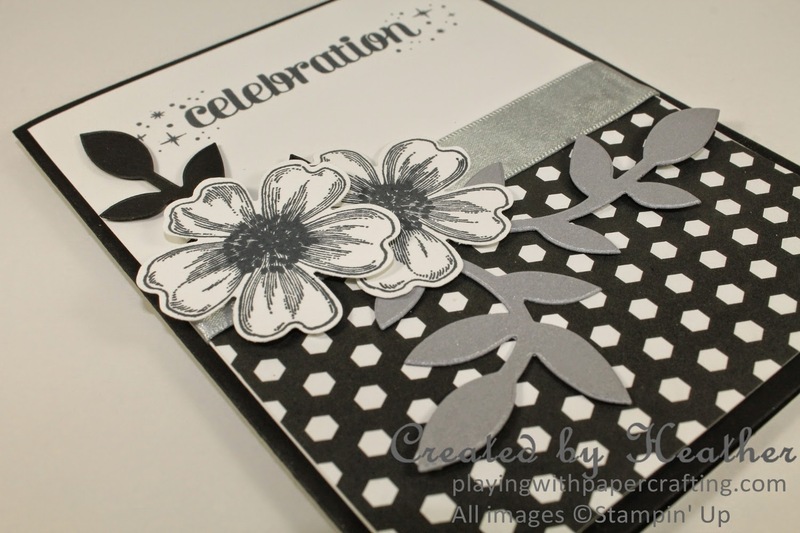 Today is the last day of Stampin' Up! 's Designer Series Paper Promotion! So I designed this card to promote one of the collections that is part of the sale: Back to Black! In our last catalogue, we had a Basic Black Designer series but it was paired with Very Vanilla, which didn't sit right with a few people. This year we have a series in Basic Black and Whisper White for all the purists out there! 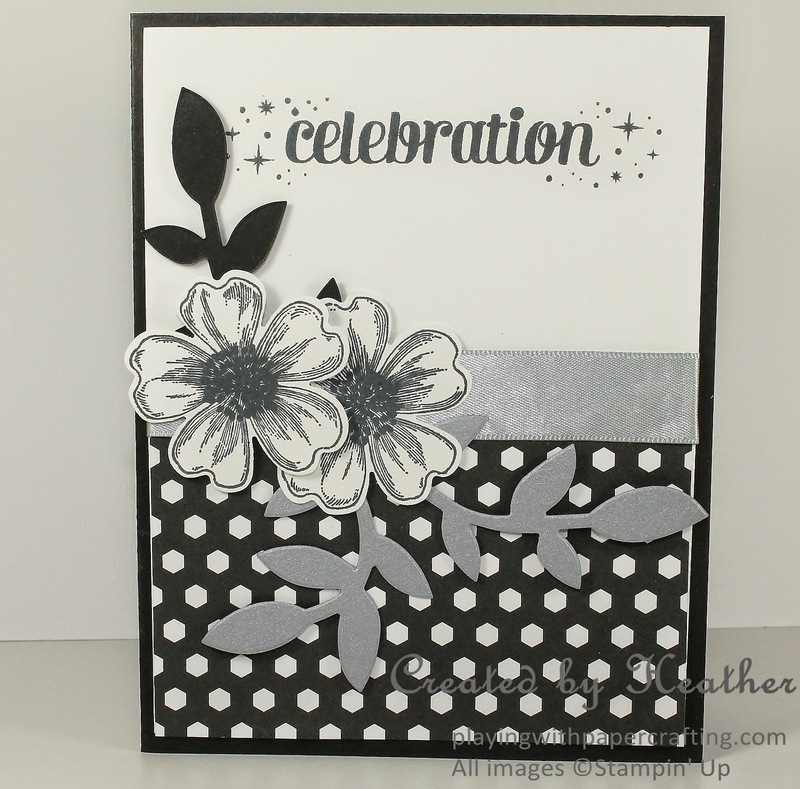 I love black and white cards, with maybe a little silver thrown it! It's so elegant and a tad dramatic which suits me just fine! Me, Heather Cooper, aka "The Drama Queen" according to my hubby! Not for a tendency to blow everything out of proportion, but because I ran the drama ministry at our church and the drama program at the school where I taught, for so long. The Designer Series Paper Promotion, in case you've forgotten the details, is Buy 3 packages of any of the Designer Series Paper on pages 186 - 187 in the 2014-15 Annual Catalogue and get one package free. That is like 25% off! But you need to act fast to take advantage of the offer. Call or email me today. On the Basic Black cardstock we have the Whisper White panel and covering half of that is the Back To Black DSP. I used some of the new Silver Satin Ribbon to mask the join of the DSP. It is the most elegant ribbon I've owned in quite some time. It has a heavy weight and a glossy sheen and it's just beautiful, as are the other colours, Gold, Whisper White and Very Vanilla. The leaves are die cut with the Flower Frenzy Bigz L die. This is one large die that I will never regret purchasing because I know that I am going to get a lot of use out of it. It has probably already paid for itself! 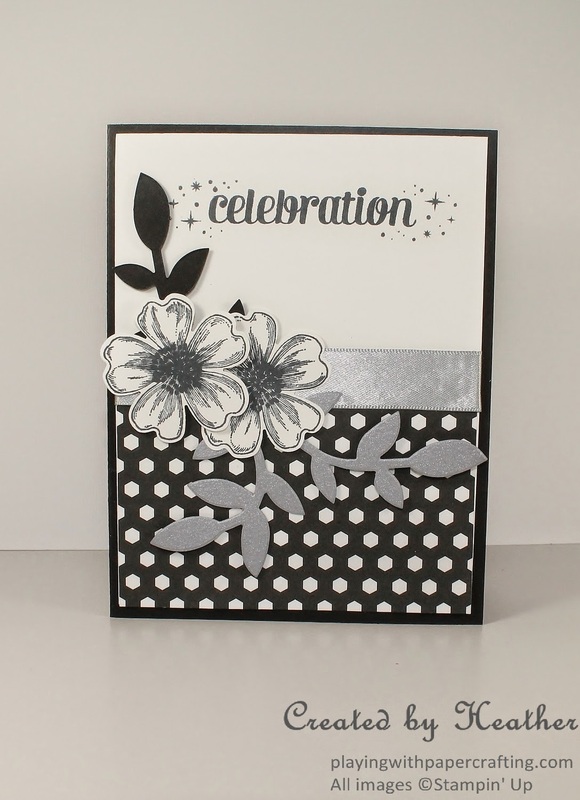 I used both Basic Black cardstock and our Brushed Silver Cardstock. 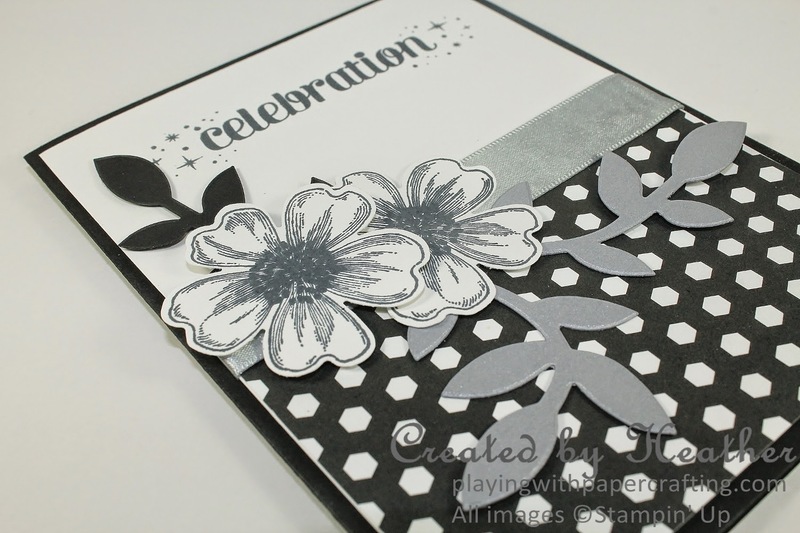 The Flower Shop Stamp Set is another really useful set that I have inked up continually since I purchased it last year. It pairs with the Pansy Punch, although sometimes it can be tricky to line them up. I have marked where the bottom of the punch should fit, on my wood block so I know to stamp that petal towards the bottom of the paper. Hope that little tip helps. The sentiment is actually a Photopolymer Stamp from the Project Life Remember This set. I loved the look of the little fireworks on each end of the congratulations, and actually, after I took this photo, I added some Rhinestones on the stars to up the bling factor!! Thanks for dropping by today. By the way, I am getting awfully close to 150,00 page views! I think it is about time for another Blog Candy Give Away! Stay tuned this weekend for the details! Also, tomorrow, August 1, you will be able to order ALL the colours of the Blendabilities Markers and there is a Big Shot promotion coming. Pop back tomorrow to find out the details!